The physical pain and discomfort of an injury is only one challenge you may face if you are the victim of an accident caused by someone else’s negligence. You may also struggle with the financial burden of denied payments from insurance companies, lost wages, and medical bills. This can result in delayed recovery and increasing difficulty in everyday tasks. Medical malpractice and car accident victims often face bankruptcy and uncertainty in their future. However, if someone else is to blame for your injuries, then you may be able to file a claim to recover compensation for these losses. If you or a someone you know has been seriously hurt, then we can help. 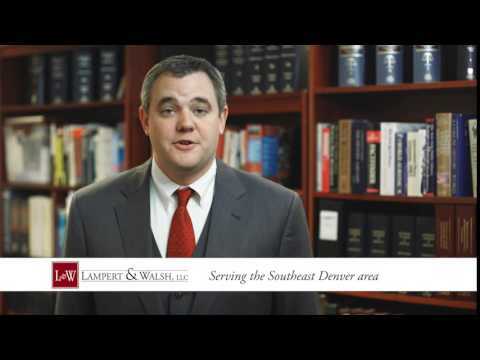 The Denver personal injury attorneys at Lampert & Walsh can guide you through all options available for your recovery. We offer free initial consultations and always work on a contingency fee basis. This means that you pay us nothing unless we get results for you. The truth is that personal injury cases are complicated, and the longer you wait the more complex they become. Therefore, you should call a personal injury attorney as soon as possible after an accident caused by the negligence of someone else. Witnesses become less reliable and evidence can vanish the longer you wait. Additionally, most victims do not have the legal experience necessary to determine the true value of their claim. Worse, insurance companies try to deny claims and minimize payments to protect their own profits. Even if you believe that your claim is straightforward, it can be difficult to negotiate a fair settlement with the insurance company. You should always get the advice of an experienced personal injury attorney before you sign anything. Read through our Accident FAQ and Accident Tips to learn more about the importance of calling a personal injury attorney quickly. Our law firm can minimize the uncertainty you may feel after an accident. We can take steps to gather all evidence and bring forward any witnesses necessary to bring you a favorable settlement. Additionally, if the insurance company does not make a fair offer, then we can help you take your case to court. What Legal Practice Areas Do Our Denver Attorneys Handle? We never represent corporations or insurance companies. Instead, our firm cares about getting to know our clients and genuinely guiding them through a quick resolution. Not all firms have your best interests at heart – if another lawyer was negligent in handling your case, then you have the right to compensation. No matter what type of vehicle your accident involved, our firm can help guide you through the claims process. This area of practice can be the most confusing and may involve sub-contractors, general contractors and manufacturers. If you sustained an injury on a work site, then you should contact a personal injury attorney immediately. You may be able to collect workers compensation and also file a lawsuit. We can assist you after any vehicle accident, including drunk driving accidents. We work in tandem with a team of doctors to make sure you receive just compensation. Maybe you received a misdiagnosis or a technician misread test results. From surgical mistakes to prescription drug errors, our law firm will investigate all the negligent parties who may be accountable. Receiving the wrong medication can be deadly serious and is almost always confusing. You may be able to file a lawsuit to recover compensation for your injuries or a loved one’s wrongful death after pharmaceutical accident. Uneven surfaces, slick conditions and deteriorating handrails are common causes for a personal injury claim. The personal injury attorneys at Lampert & Walsh can stand by you after an accident or injury. We can fully investigate your accident and work with experts to defend your right to a speedy recovery. While a settlement will not bring back the time you lost, it will lay the foundation for your unencumbered future. Our staff is ready to help you move on with your life. Call us today at 720-489-5848 or contact us online to schedule an initial consultation at no cost. Our Denver personal injury law firms have a history of successfully defending victims with substantial verdicts since 1979.